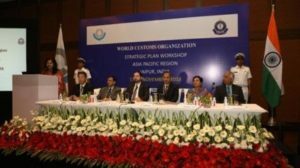 On 13 and 14 November 2018, the WCO completed its regional consultation process on the Strategic Plan 2019/2022 with the 6th regional workshop held in Jaipur, India, Asia/Pacific (A/P) region. The workshop was jointly chaired by Mr. Ricardo Treviño Chapa, WCO Deputy Secretary General, and Mr. S. Ramesh, Chairman of Indian Customs and WCO Council Vice-Chair for the A/P region. Seventeen of the A/P region’s Member countries, as well as the Regional Office for Capacity Building for the A/P region, were in attendance. In his introductory remarks, the Deputy Secretary General reminded those present that it was of prime importance to strengthen Members’ involvement. This 6th and last regional meeting on the Strategic Plan concluded the first consultation cycle of a new approach undertaken by the WCO for drafting its Strategic Plan. He presented the agenda, which focused on the results of the survey on priorities, the financial allocations for the current Strategic Goals, the linkages between the Strategic Plan and the Environmental Scan, and the first draft proposal for a new Strategic Map, which constituted the basis of the next Strategic Plan. The Vice-Chair for the A/P region welcomed the Deputy Secretary General and expressed his appreciation for the consultative approach. He considered that regional priorities had to be taken into account in the WCO’s overall strategy. He stated that Customs were operating in a fast-changing environment, greatly impacted by the emergence of new technologies. The role of Customs had to be regarded from both facilitation and security perspectives, given their significant responsibilities in these areas. He added that the Strategic Plan 2019-2022 should be forward-looking and adapted to Members’ needs. During the discussions, delegates considered that the current numerous Tactical Activities and Key Performance Indicators (KPIs) were jeopardizing the readability and potential usage of the Strategic Plan. They insisted on the need to consolidate the current areas into meaningful single concepts, based on a proper prioritization of the activities. Funding should match the main Strategic Goals, and be allocated in accordance with the critical aspects of today’s Customs operations. The entire Strategic Plan should be based on strong KPIs and a robust performance measurement mechanism to assess its implementation in practice. The A/P region introduced its own Strategic Plan, running from 2018 to 2020, and held discussions in breakout sessions on the linkages between the Regional Plan and the WCO Strategic Plan, as well as the main current and future regional priorities. The conclusions were that further alignment between the plans was needed, at least as regards the time period covered. As priorities, the A/P region representatives mentioned trade facilitation, security, revenue collection and e-commerce. They considered that these areas should all be supported by capacity building and technological development, as transversal concepts. The need to promote performance measurement, working towards the adoption of a positive mindset on this matter, was also mentioned. Delegates considered that Members’ engagement had to be pursued and strengthened in the future. Finally, the Secretariat took note of a number of relevant comments to improve the draft Strategic Map. Delegates also considered that the Mission and Vision Statements had to be reviewed, and provided the WCO with some suggestions to that effect. They also proposed that the Plan cater for Customs emerging issues. By organizing these regional workshops, the WCO Secretariat is fulfilling its obligations in terms of transparency, and also with regard to its mandate as a Member-driven Organization, ensuring that its Members’ views are incorporated in the WCO Strategic Plan 2019-2022.